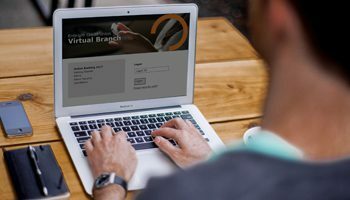 Virtual Branch is a free service that gives you access to your Enbright accounts online. You can check your balances, make transfers and loan payments, view your previous statement history and manage several other online services. Click here to visit Virtual Branch. You’ll need the Logon ID and security code you receives when you opened your account. Manage in your online bill payments in Virtual Branch. When you pay at least six bills each month, the service is free. When less than six bills are paid online monthly, there is a monthly charge of $5.95. You may add Bill Payment in your Virtual Branch menu. Need to pay someone? Now you can do it electronically, even if you don’t know their account information. Plus, your account information is kept safe from view. To use PopMoney, log in to Virtual Branch and choose the PopMoney tab. Enter the email address or mobile phone number of the person you need to pay from your (required) share draft checking account at Enbright. You can even include a personal message to your receipient. the receipient receives an e-mail or text from popmoney that instructs them about how to receive the money you have sent. You will receive an e-mail that lets you know when the payment was received. E-statements offer safety and convenience. Those who are enrolled in e-statements do not receive a paper statement. An email alert is sent monthly to notify you that your statement is ready for viewing in Virtual Branch. To request the e-statement service, log in to Virtual Branch and accept the e-statement agreement.